CLICK HERE to purchase at Amazon.com U.K.
August 2, 2010 will be a date to remember in the legacy of Judy Garland’s recording career. It’s definitely important to Judy’s legion of fans. It’s the date that, finally, after all these years, the “Lost Decca Tests” are being released to the public. This is important for two main reasons. 1: These are the very first studio recordings of one of the most loved, greatest (some say THE greatest) voices of the 20th century. 2: The film shorts from 1929/1930 are the earliest recordings of Judy, but those were recorded live on the film sets, not in a studio, and they feature a loud 7-year-old Judy who, while obviously photogenic and exhibiting some vocal prowess, had not fully matured as a vocalist. But within a few short years she would, and these Decca tests are the only record of her voice as audiences thrilled to it before her tutelage with Roger Edens at the MGM Studios. They’re the “missing link” between those early shorts and the Edens tutelage that fans (and vocal experts) have always wanted to hear. The closest we’ve ever gotten are the two radio air check recordings made just after she signed with the studio at 13 in the fall of 1935. 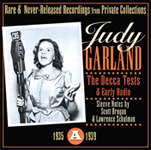 Thought to have been lost, two of the three test recordings made on March 29, 1935 for Decca, and ultimately rejected, miraculously survived these past 75 years. Luckily, they’re Judy’s two solos: “Bill” (the torch song from “Show Boat” – test record shown at right) and a medley of “On The Good Ship Lollipop/The Object of My Affection/Dinah” both with mom Ethel providing piano accompaniment. 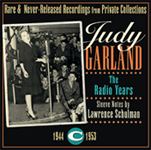 A third recording, “Moonglow,” that Judy sang with her two sisters (as “The Garland Sisters”) has not survived. That we know of. The two discs were found in 1960 in a garbage heap outside of Judy’s recently vacated home in the Hombly Hills of Los Angeles, California. The family who found them had no idea what they had, until 2004 when an internet search by their now grown-up daughter Cynthia led her here to The Judy Room, where she found the information she was looking for and was pleasantly surprised to find out just how rare these discs really are. CLICK HERE to read the full story. These records do not disappoint. Judy’s voice is amazingly mature. Her delivery is fresh out of Vaudeville, in a charming way. She’s socking it across the footlights. Plus, in the span of the two tracks, Judy covers torch singing, jazz/swing, growling, and just about every other vocal inflection one can think of. And all at 12 years old! Regardless of what people might say about Judy’s mom Ethel Gumm and her motives, vocally she had Judy on the right track. This girl was obviously going to be a star. It’s easy to hear why audiences were blown away. But this new set isn’t just these two amazing performances. It’s a comprehensive 100 track compilation, 55 on CD for the first time! Included are many rare, previously unreleased radio and live performances, plus some previously released (mostly on old bootleg LP’s) that are newly remastered here. 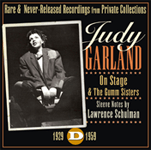 A stellar set, a “must have”, and to date the best overall CD compilation of Judy’s rare, radio, and live performances. 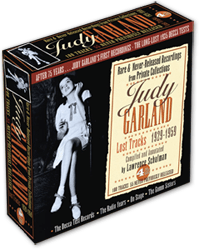 Now available in the UK (as of August 2nd) and coming to the U.S. on August 10, “Lost Tracks” is THE Judy Garland CD release of the year. Even if it were just one CD with the famous “Lost Decca Tests” it would be a milestone. However, at a generous FOUR CDs, it’s an item that should be a requirement for any serious Judy fan. CLICK HERE to read The Judy Garland Discography Spotlight on The “Lost” Decca Records (and the auction). 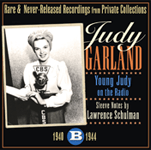 CLICK HERE to read The Judy Garland Discography page devoted to the entire set. Although my name is on the first CD’s liner notes as co-author, I really can’t take any credit for this release. My name is there solely because some of my website reporting on the history of the Decca tests is included. And while I’m honored to be a small part of the Decca tests being released officially to the public, the man behind the set and the one who did all the work in brokering the deal for the Decca tests and in compiling the set is Lawrence Schulman. He deserves all the accolades the set will, and should, receive. There really is something for everyone here: Rarities, oddities, expected songs, performances we’ve heard before and many we haven’t. Available August 2 in the U.K., and August 10 in the U.S.